Melt chocolate candy melts according to package directions. 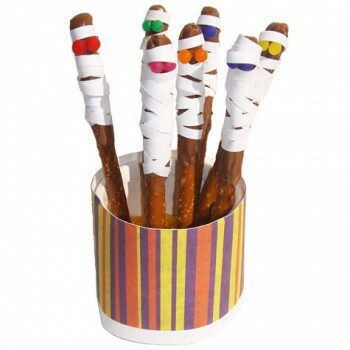 Twirl pretzel rods in melted chocolate; let cool in fridge. Once hardened, remove from fridge and “glue” 2 Decors for eyes (use a drop of melted chocolate as the glue); let harden. Wrap each rod in the strips of candy paper. Secure with a drop of Icing if needed.